The gutted Melanie Damishana House. Six persons are now homeless after an ex soldier went berserk early yesterday morning, stabbing his stepdaughter, wounding his wife and chopping his son, before setting their one flat concrete house on fire. The incident took place on the Railway Embankment at Melanie Damishana, East Coast Demerara at around 02:00 hours. The ex-soldier, Rawle Glasgow, who now works as a security guard, disappeared after setting the house alight, but later turned up at the Georgetown Hospital, claiming that he had ingested a poisonous liquid. Kaieteur News understands that Glasgow went into a rage after accusing his reputed wife Dianne Nestor of being unfaithful. According to the woman’s daughter Shaneza Nestor, who has a 10-month old baby, at about 02:00 hours, her stepfather approached her with two knives in his hands. “He say, ‘You know your mother cheating on me, right?’ I told him that I don’t know anything about that. Then he tell me that one of the knives was for me because I know my mother cheating and I keeping it quiet,” Shaneza Nestor told this newspaper. She stated that after a few words were exchanged between her and her stepfather, the man attempted to stab her but she parried the blow resulting in just a slight cut to her abdomen. Sensing danger, Nestor bolted from the house, while alerting her 23-year old brother who was asleep at the time. She however had to hurry back to collect her sleeping baby, and thankfully she did, for pandemonium broke out in the house soon after. The young woman, who happens to be a soldier also, said that with her baby in her arms, she scaled the fence into her neighbour’s yard and hid on the patio, desperately hoping that her stepfather would not follow her. According to Nestor, her brother Rawle Jnr. woke up in the nick of time just as Glasgow was preparing to inflict blows on the boy’s hapless mother. The young man bravely held on to his father despite being chopped twice on his hand, and screamed for his mother to run. 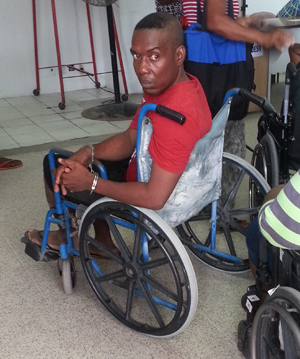 Rawle Glasgow at the GPHC after reportedly ingesting poison. “My brother hold on to he and tell my mother to run. I see when my mother ran out of the yard but I didn’t know where she went,” Nestor told this newspaper. Initially it was thought that her brother had perished in the blaze. But in fact her brother had also fled the scene and it was not until dayclean that both he and his mother felt safe to return to what was once their home. “My mother told me that she was hiding in the bush, she was afraid that my stepfather would find her, so she waited until the place get bright,” Nestor stated. Meanwhile, she said that from her hiding place in the neighbour’s house, she saw her stepfather talking to his mother, who shared the home with them, advising her to take whatever valuables she had, and then she saw the fire. “Is he light it afire. Now we ain’t lef with nothing, all we clothes, phones, everything get burn up in the house,” she declared. Her neighbour Ursilla told this newspaper that she heard Nestor knocking at her window and since it was in the wee hours of the morning she knew that something terrible was happening. “I hear she calling ‘Auntie Ursilla’ and when I eventually open up and let her in, then she told me that her stepfather tried to bore her with a knife but she knock away his hand,” Ursilla recalled. 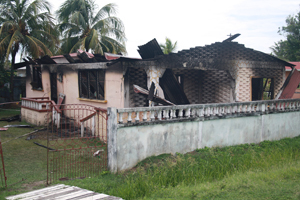 She said that she subsequently saw smoke coming from Nestor’s house and suspecting that the house was on set on fire, she immediately summoned the Guyana Fire Service. Firefighters responded promptly but their efforts were hampered by a lack of adequate water and by the time they managed to rectify the problem, it was too late to save the building. Later yesterday morning, the man’s reputed wife and son both turned up at the hospital to be treated for their injuries even as he was wheeled in to the Accident and Emergency Unit for treatment on the suspected ingestion of poison. “When he started, I sit in front of him and begged him…I tell him look how happy we living and he accusing me of cheating. I don’t go anywhere when the day come, from work is home… I don’t have time to cheat,” Nestor said while fighting to hold back tears. She added that her husband of 10 years would usually accuse her of having someone else but had never behaved in such a manner. Nestor, who was a bit hesitant to speak to the media said that she could not speak to males in the neighbourhood and at her workplace because of her husband’s ‘jealous’ attitude. The woman’s relatives believe that Glasgow was aided by his family to escape, knowing that his actions were criminal and would lead to him being prosecuted. Police are awaiting a report on Glasgow’s condition from the hospital before proceeding with a view to instituting charges of Arson and Attempt Murder.